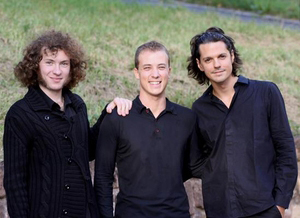 Although many concerts yet remain until the closing-night gala (Canada’s love affair with tango continues with Viva España, August 14), JWR’s coverage of the 2010 season came to an early close with “French Connection”—works from Ravel, Debussy and Fauré performed by the Trio Magellan in its festival début. The three musicians (Julian Gernay, piano; Pierre Fouchenneret violin; Antoine Pierlot, cello) provided compelling hope that the preponderance of “good-enough” performances witnessed in many of these pages has the chance of being eradicated like H1N1—if only audiences would insist that every bar be raised in the current performance standard of our most universal art; failure to do so can only assure the current plague of acceptable, if hardly memorable results. The coming litmus test (46 concerts over nearly five weeks at the Lucerne Festival, cross-reference below) will give even more fodder for a long-form prognostication of the future health of classical music. Stay tuned! In the vastly improved acoustical confines of St. Mark’s Church, the program lifted off with an engaging reading of Debussy’s Piano Trio in G Major Fouchenneret led the way with an easy-flowing, warm sound that readily inspired his colleagues to follow suit. Gernay was a model of clarity even as Pierlot sent his dulcet tone effortlessly to the high ceiling. As good as the ensemble was, when everyone manages to relax collectively, the music will soon morph from very good to outstanding. The second movement was notable for deft pizzicati and a “same-length/different timbre” strategy that eludes many other groups. The “Andante espressivo” was the weak cousin of the four after a marvellous opening “answer” from Pierlot of Gernay’s seul statement. The remainder couldn’t quite recapture that degree of emotional outpouring. No worries—all was redeemed in the impassioned “Finale” where the commitment of the three artists was as welcome as needed rain. Ravel’s only sonata for two string instruments (the first movement was published in 1920 as “Duo”—part of the collection Le Tombeau de Claude Debussy) had a vibrant, jazzy feel in the Allegro (if a somewhat scrambled climax), rough-and-ready (yet always energized) “Très vif,” impressively alluring “Lent” (the two instruments frequently merged as one) and a delightful “Vif” that more than justified the enthusiastic response from the attentive crowd. After the break, Debussy’s Sonata for Cello and Violinwas given a passionate, engagingly free performance by Pierlot. Gernay proved to be a formidable accompanist, allowing his partner to spontaneously explore the possibilities of line and language at whim. The exceptionally mysterious, personal moments interspersed between dashes of excitement in the “Sérénade et Final” will remain in special memory for a long time to come.